After earning $28.8 million on Wednesday and Thanksgiving Thursday, Ralph Breaks the Internet came in with a spectacular $21.7 million for Black Friday. People certainly found time to catch a movie in the midst of all the shopping madness. With $50.5 million in its coffers, Wreck-It Ralph 2 has exceeded the first three days of the original film ($49 million). Although that film released earlier in the month, it did have the exact same holiday pattern several weeks later as Thanksgiving that year was also on November 22nd. If a similar pattern holds, Ralph Breaks the Internet will earn $54.5 million over the Friday-to-Sunday portion of the weekend and tally about $83.3 million for the five day portion of the holiday. Then, it's going to be the only real kid-friendly (or just about anyone-friendly) option until December 14th, when Spider-Man: Into the Spider-Verse swings into theaters. 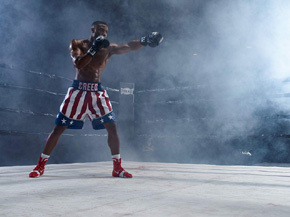 A sequel to the popular and critically acclaimed Creed, Creed II followed its Wednesday/Thursday box office take of $20.5 million with a Black Friday total of $14.1 million. That means the Rocky franchise film has $34.6 million so far, which is pretty awesome when you consider that the first film earned $109.8 million TOTAL from domestic venues. For Friday-through-Sunday, MGM will likely estimate the film at $38.3 million (though they might bump up to $40 million), which means it will be sitting with about $60 million domestically after just five days. With an A Cinemascore, audiences are plenty happy with this one, so I see no reason it shouldn't continue to chug along. You'd be forgiven for not knowing that a weird Robin Hood film was released this weekend. Starring Kingsman's Taron Edgerton and Jamie Fox as Little John, it just found no traction whatsoever, probably because reviews were scathing (11 percent fresh at Rotten Tomatoes) and the Cinemascore was just blah at a B. It has $8.5 million total and earned $3.5 million yesterday. Lionsgate will probably give it the benefit of the doubt and estimate the weekend at $10 million.